PEBBLE BEACH, CA (August 11, 2018) - The 312-player field for the 118th U.S. Amateur Championship is set, and players will tee it up at Pebble Beach GL and Spyglass Hill GC as stroke play begins on Monday with the biggest title in amateur golf up for grabs. John Augenstein, 20, of Owensboro, Ky., comes into the week as the #2 ranked player in the Golfweek/AmateurGolf.com World Amateur Ranking. He has been the model of consistency in big events, seemingly always in contention and picking up the trophy at the 2018 Players Amateur with an impressive four-shot win. Augenstein made the quarterfinals of the Western Amateur and had top-5 finishes at the Sunnehanna Amateur, Southern Amateur and Jones Cup. He also finished 6th at the Northeast Amateur and 9th at the NCAA Championship. At Vanderbilt University he posted a 71.10 stroke average and was an All-SEC Second Team selection, getting his first college win at the Mason Rudolph Championship. Shintaro Ban, 22, of San Jose, Calif., enters the week as the World #5 ranked amateur. He is competing in his second U.S. Amateur and qualified for this year’s U.S. Open at Shinnecock Hills Golf Club, in Southampton, N.Y. Ban recently graduated from UNLV, where he was named the Mountain West Conference Player of the Year as a senior. He was a Jack Nicklaus National Player of the Year finalist and a semifinalist for the Ben Hogan Award, while also garnering WGCA All-America and All-West Region honors. Ban helped the USA claim the 2018 Palmer Cup at the Evian Resort Golf Club in France. Zach Bauchou, 22, of Forest, Va., has advanced to the Round of 32 in each of his previous two U.S. Amateurs. Four days before the U.S. Amateur, he won the Canadian Men’s Amateur Championship for the second consecutive year, firing a final-round 66 for a three-stroke victory and tied the championship record at 18-under-par overall. Bauchou, who was the 22nd American to claim the Canadian Amateur title last year, also finished third in 2015 and 2016. Bauchou, who will be a senior at Oklahoma State University, helped the Cowboys win the 2018 NCAA Championship. He earned second-team All-America and All-Big 12 Conference recognition while posting six top-10 finishes. Cole Hammer, 18, of Houston, Texas, advanced to the semifinals in this year’s U.S. Junior Amateur at Baltusrol Golf Club and won the U.S. Amateur Four-Ball with partner Garrett Barber. Hammer, who was the third-youngest player to compete in a U.S. Open when he played at Chambers Bay in 2015, is playing his second U.S. Amateur and ninth USGA championship. Hammer captured the Western Amateur on Aug. 4, defeating Davis Riley, 1 up, in the championship match. Hammer, who will attend the University of Texas in the fall, also claimed the Azalea Invitational when he defeated Hugo Bernard and Joseph Pagdin in a playoff. Viktor Hovland, 18, of of Norway, earned first-team All-America and All-Big 12 Conference honors in his sophomore season at Oklahoma State University and helped the Cowboys win the 2018 NCAA Championship. He had eight top-10 finishes, including a tie for third in the Big 12 Championship. Hovland, who tied for 11th in the NCAA Championship, was a member of the 2018 Palmer Cup International Team. Hovland, who is competing in his second U.S. Amateur, lost the 2016 European Amateur to Luca Cianchetti in a seven-hole playoff. He fired a final-round 65 in in the 2016 World Amateur Team Championship to help Norway place fifth, its best-ever finish. Matthew Jordan, 22, of England, recorded a nine-stroke victory in the 2018 Lytham Trophy at Royal Lytham & St Annes on May 6. Jordan, who was a member of the 2017 Great Britain and Ireland Walker Cup Team, tied for 16th in the European Amateur. He captured last year’s St. Andrews Links Trophy and was the runner-up in the Scottish Stroke Play Championship. Jordan, who reached match play in the 2017 Amateur Championship, conducted by The R&A, helped England finish second in last year’s European Team Championship. Sean Knapp, 56, of Oakmont, Pa., won the 2017 U.S. Senior Amateur, defeating Paul Simson, 2 and 1, at The Minikahda Club, in Minneapolis, Minn. Knapp is competing in his 14th U.S. Amateur, but first since 2010, and his 44th USGA championship. He advanced to the U.S. Amateur quarterfinals in 1998 and reached the Round of 16 in the 1995 U.S. Amateur before losing, 2 and 1, to eventual champion Tiger Woods. He is a 14-time Western Pennsylvania Golf Association Player of the Year. Knapp, who is vice president of financial sales for an investment management firm, began playing golf at age 19 while caddieing at Oakmont (Pa.) Country Club. Min Woo Lee, 20, of Australia, is competing in his third consecutive U.S. Amateur and fifth USGA championship. He defeated Noah Goodwin, 2 and 1, in the 36-hole final to win the 2016 U.S. Junior Amateur. He became the fourth international champion of the Junior Amateur and the first male Australian in 10 years to win a USGA title. Min Woo made the quarterfinals of the PGA European Tour's World Super 6 tournament this year, and made the final 16 of the Western Amateur for the second straight year. Min Woo reached the Round of 32 in the 2018 Australian Amateur and was the 2017 runner-up in the same event. He won the 2018 South Australian Amateur by six strokes. Collin Morikawa, 21, of La Cañada Flintridge, Calif., comes into the week ranked World #3. He is competing in his fourth straight U.S. Amateur, advancing to the Round of 16 the previous two years. He posted a perfect 4-0 record in leading the USA to a 19-7 victory over Great Britain and Ireland in the 2017 Walker Cup Match, and was the 2017 Northeast Amateur champion. Morikawa earned first-team All-America and first-team All-Pac-12 Conference honors as a junior at the University of California and broke a 14-year-old single-season NCAA record by posting a 68.68 stroke average in 2017-18. Morikawa was also a member of the winning 2018 USA Palmer Cup Team. Matt Parziale, 31, of Brockton, Mass., is the current #1 in the AmateurGolf.com Mid-Amateur Rankings. Parziale won the 2017 U.S. Mid-Amateur Championship by defeating Josh Nichols, 8 and 6, at Capital City Club in Atlanta, Ga. Parziale became the first Mid-Amateur champion to earn a full exemption into the following year’s U.S. Open. His margin of victory matched the third-largest in championship history. 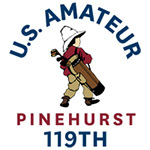 Parziale, a firefighter with the Brockton Fire Department, and Luis Gagne were the low amateurs in the 2018 U.S. Open, tying for 48th at Shinnecock Hills Golf Club. Parziale was reinstated as an amateur in 2013 after competing on the NGA Hooters and eGolf tours and making three trips to PGA Tour Qualifying School. Garrett Rank, 30, of Canada, is competing in his seventh U.S. Amateur and 17th USGA championship. In 2016-17, Rank became a full-time official in the National Hockey League after working for several years in the American Hockey League. Rank, who overcame a cancer scare at age 23, is one of 16 players in the U.S. Amateur field who competed in this year’s U.S. Open at Shinnecock Hills. Rank was the runner-up in the 2012 U.S. Mid-Amateur and has advanced to at least to the quarterfinals with partner Patrick Christovich in three consecutive U.S. Amateur Four-Balls (2016-18). He is currently #2 in the AmateurGolf.com Mid-Amateur Rankings. Isaiah Salinda, 21, of South San Francisco, Calif., is competing in his first USGA championship. Salinda, who will be a senior at Stanford University, was chosen honorable mention All-America and All-Pac-12 Conference in 2017-18. He tied for 15th in the NCAA Championship and tied for 23rd in the NCAA Pacific Regional. Salinda won the 2018 Pacific Coast Amateur by one stroke over Austin Eckroat, shooting 12-under 272 at The Olympic Club’s Lake Course. He followed that up by making the Final 16 at the Western Amateur. Alex Smalley, 21, of Wake Forest, N.C., is competing in his third consecutive U.S. Amateur. He reached match play last year and was the stroke-play medalist and advanced to the Round of 32 in 2016. Smalley, a rising senior at Duke University, earned both All-East Region and All-Atlantic Coast Conference recognition for the second straight year. He finished 10th in the NCAA Raleigh Regional and tied for 12th in the ACC Tournament. In 2018, Smalley won the Sunnehanna Amateur by two strokes over Quade Cummins with a 72-hole score of 11-under 269. Justin Suh, 21, of San Jose, Calif., arrives at Pebble Beach as the #1 ranked player in the Golfweek/AmateurGolf.com World Amateur Ranking. At college, he earned first-team All-America honors and was the Pac-12 Conference Player of the Year as a junior at the University of Southern California. Suh, who broke USC’s single-season records for stroke average (68.73) and rounds in the 60s (21), is competing in his third U.S. Amateur and eighth USGA championship. Suh, who won the 2018 Pac-12 Championship, has advanced to match play in the U.S. Amateur twice. He won this year’s Northeast Amateur by six strokes with a 72-hole score of 15-under 261. Michael Thorbjornsen, 16, of Wellesley, Mass., won the 2018 U.S. Junior Amateur Championship, defeating Akshay Bhatia, 1 up, in the 36-hole final at Baltusrol Golf Club. As a result of his victory, he receives an exemption into the 2019 U.S. Open at Pebble Beach (Calif.) Golf Links. Thorbjornsen, who was competing in his first USGA championship, played in the 2018 AJGA Wyndham Cup. He won the 2016 Drive, Chip & Putt National Final (ages 14-15) at Augusta National Golf Club and was the 2012 and 2013 U.S. Kids Golf National Player of the Year. Braden Thornberry, 21, of Olive Branch, Miss., was the 2017 AmateurGolf.com Player-of-the-Year and comes into the week #4 in the world ranking. He is competing in his fourth U.S. Amateur and advanced to the Round of 32 last year. Thornberry became the third player in University of Mississippi history to be chosen All-American multiple times and earned All-Southeast Region and All-Southeastern Conference recognition for the second consecutive year. He competed in this year’s U.S. Open and has gone T4 and T26 in the last two PGA Tour’s FedEx St. Jude Classics. In 2017, he won the Sunnehanna Amateur, the NCAA Championship and earned the Fred Haskins Award as the top collegiate golfer. Brandon Wu, 21, of Scarsdale, N.Y., earned exempt status into the 2018 U.S. Amateur through his No. 41 position in the second World Amateur Golf Ranking™ top 50 category that was determined on Aug. 8. Wu, a rising senior at Stanford University, was chosen All-West Region and first team All-Pac-12 Conference in 2017-18. He finished second in the NCAA Pacific Regional. Wu, who was born in Danville, Calif., but lived in Beijing for five years, advanced to the semifinals of the recent Western Amateur and was third in the Pacific Coast Amateur. Wu won the 2017 Porter Cup by three shots. Chun An Yu, 20, of Chinese Taipei, advanced to the quarterfinals in last year’s U.S. Amateur, falling to Theo Humphrey, 1 up. Yu, who competed in this year’s U.S. Open at Shinnecock Hills, is a rising junior at Arizona State University. He earned All-West Region and second-team All-Pac-12 Conference recognition in 2017-18. Yu, who is playing in his fourth USGA championship, tied for fifth in the NCAA Raleigh Regional and tied for 21st in the NCAA Championship. Yu posted the second-best stroke average (71.61) by a freshman in Sun Devil history behind Jon Rahm. Watch out for Hurly Long of Germany. In last year's Carmel Cup tournament at Pebble Beach, Long, playing for Texas Tech, set the competitive course record at Pebble Beach with a 61 in the second round. He followed it up with a 67 and beat Oklahoma State's Hayden Wood for the individual title in a playoff. The U.S. Amateur, the oldest USGA championship, was first played in 1895 at Newport Golf Club in Rhode Island. The event, which has no age restriction, is open to those with a Handicap Index of 2.4 or lower. It is one of 13 national championships conducted annually by the USGA, 10 of which are strictly for amateurs. It is the pre-eminent amateur competition in the world. Applications are typically placed online, starting the third week in April at www.usga.org.